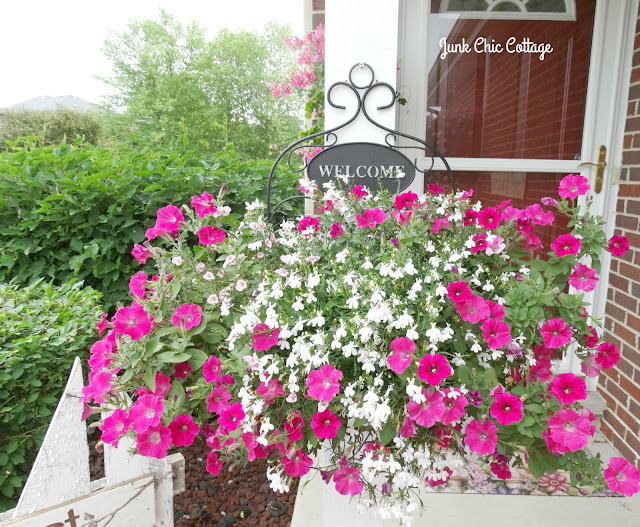 I was a little worried with downsizing to a town home that I would not be able to have all my pretty flowers I love each summer. So I just added my planted flowers where ever I could find an open spot in the landscaping. 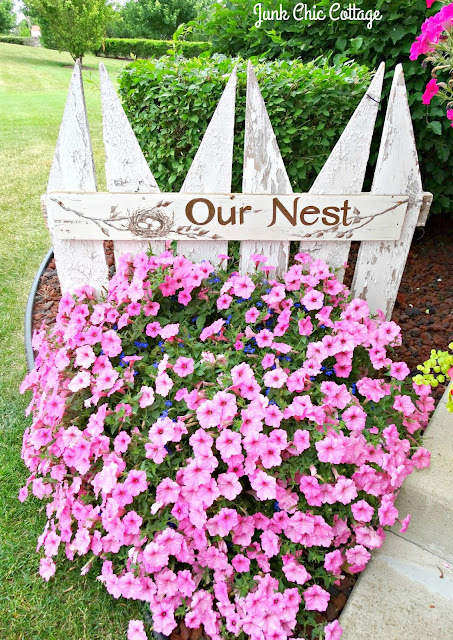 Love that I could re use my "Our Nest" sign on this picket fence in the front. 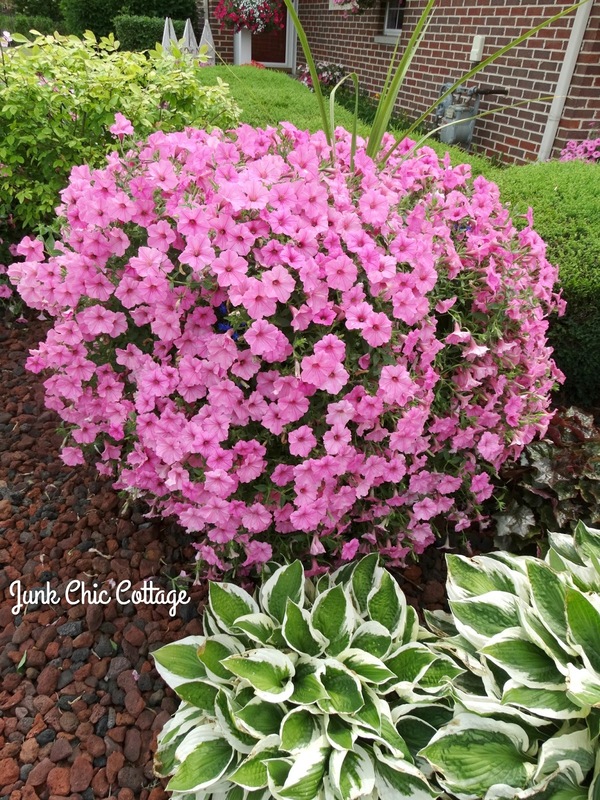 Planted all my sun loving Petunia's in the front yard where they will get more sunshine. This is our backyard area. Nice open space. We have homes behind us but they are set back and the trees really gives us privacy. My sweet friend gave me this cute Bless this House plaque for a house warming. Love the pretty flowers and saying. I have a sweet little spot for my lounge chair just off the patio area. When you do not have a lot of outdoor space you have to be creative and utilize the space the best you can. This is my cute hand painted mail box I had at the other house. We do not have street mail boxes here so I figured I would just put it in the back garden. I have had this little mail box for years. Just poly the heck out of it each year and it holds up beautifully. Not a big space out back but enough for Terry and I to sit out and have dinner el fresco and for me to soak up some sun and read with my lounge chair. The back of the town home faces east so I do not have to have an umbrella. The sun is up and over the house in the afternoon and a nice shade over the patio lets us eat outside without having to have an umbrella. So there is our new nest on the outside. Summer is beginning again in my new garden areas. I am a summer girl!!! Just love my flowers and sunshine. I learned you can still surround yourself with the flowers and beauty you love and you do not need a lot of space to do it. I will have the first floor and kitchen pictures coming up soon and pictures of the lower level of Terry's new Fireman Cave. Stay tuned. Have a great Sunday and wonderful start to the new week. Lovely outdoor space. You have done an amazing job in such a short time with the outdoors! Kris, your new outdoor space is wonderful! I would think that having the townhome on the end would make all the difference. Your flowers look right at home and add all the cottagey beauty to your new home. Love it!! I have to admit I wondered with you being in a town home if you would have a yard. I am so happy to see that you still have your wonderful flowers all around you! They are so beautiful!! I always look forward to your outside summer tour. This did not disappoint . You have a way with flowers Kris. I think it's amazing that you've done so much already. Everything looks absolutely beautiful and so charming. Well Kris what can I say besides I see you and Terry living constant moments of happiness in each and every day in your pretty new nest. I've found having a city postage stamp for a lawn size has opened up more possibilites for creative landscaping and plantings. It's opened me up to being more adventous this year with design, I think your cottage look is inviting and pretty. Thanks for the pretty share. It looks fantastic! You know I only have a patio and a plethora of plantings! I am so happy you have a great space to sit and relax outside, everything looks so pretty. Kris - Your flowers are just gorgeous!! What do you do to get them to grow so big?? I too am a summer girl... my yard leaves much to desire in the pretty flowers category. 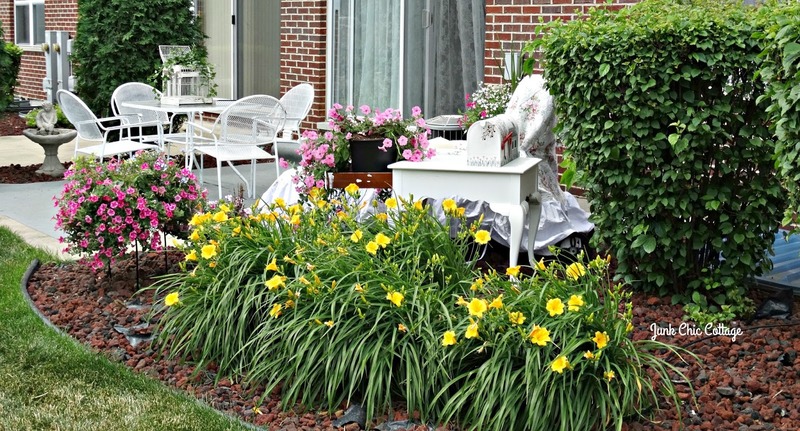 Your pictures of your out door space bring me much inspiration. Daily, I have someone re pinning a picture of you lounge space to their own board. My back yard had fallen in total unkemptness over the last few years with my hip issue, that I let the lawn die as I could not mow it. I now have the lawn area cleared of weeds and have planted a few fruit trees that will remain smaller. I plan on several smaller planting areas where I can put some annuals for summer color. I need to consider that we are still on watering restrictions, now only 2 days a week with fines imposed if caught doing more often. Excited to see your future planned posts. Enjoy your sunshine, you summer gal! Oh Kris, your flowers are stunning, and I just love them - they are beautiful. You really whipped that back yard into shape. Looks like you have a very nice area to eat and relax in. Looking forward to see your home with your stamp on it. What a lovely space you created. Well done. I am happy you are able to use some of your favorites. I love your lounge chair, what a great idea of placing it where you did. You have the touch to make your surroundings and home lovely! It is lovely, Kris! Your petunias are so lush, mine never do that. Such a pretty color scheme too. I think smaller gardens are so sweet, and even better, they are manageable. It looks so pretty, Kris and it really looks happy, too. I know you will enjoy all summer and into the fall out there. I feel like it's home to you just seeing your lounge chair sitting out there! Your petunias look wonderful. It's all looking so gorgeous Kris. I'm loving all the pink! Oh, I love everything! 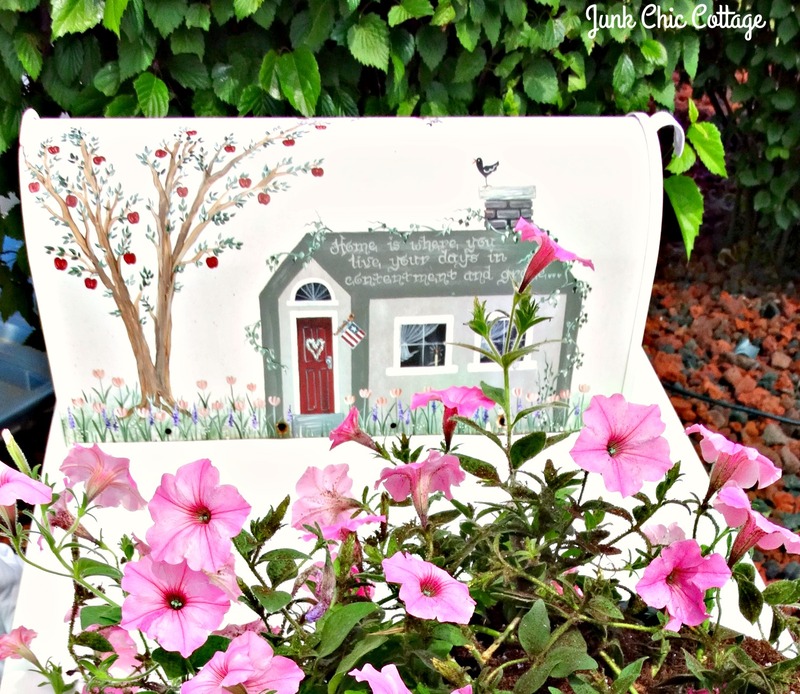 I'm so happy you have a place to have your pretty lounge chair--always my fave! 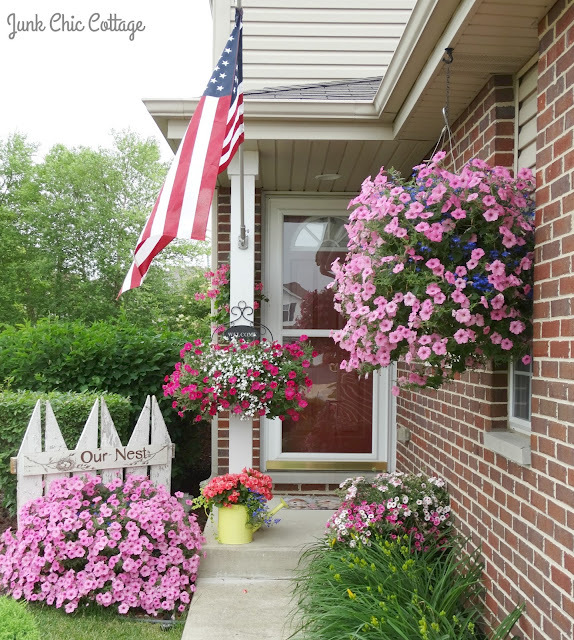 Gorgeous flowers, they make a house a home---at least outside. Your neighbors are probably loving it!! Kris, just that little picket fence sign, just THAT ALONE gives the Shabby White Junk Chic look. Marvelous garden space my friend! And, having limits on space is good for our creativity. Having to solve "problems" or rather finding solutions for limited space is actually a great learning experience because it helps us to stretch our imaginations and create new solutions. 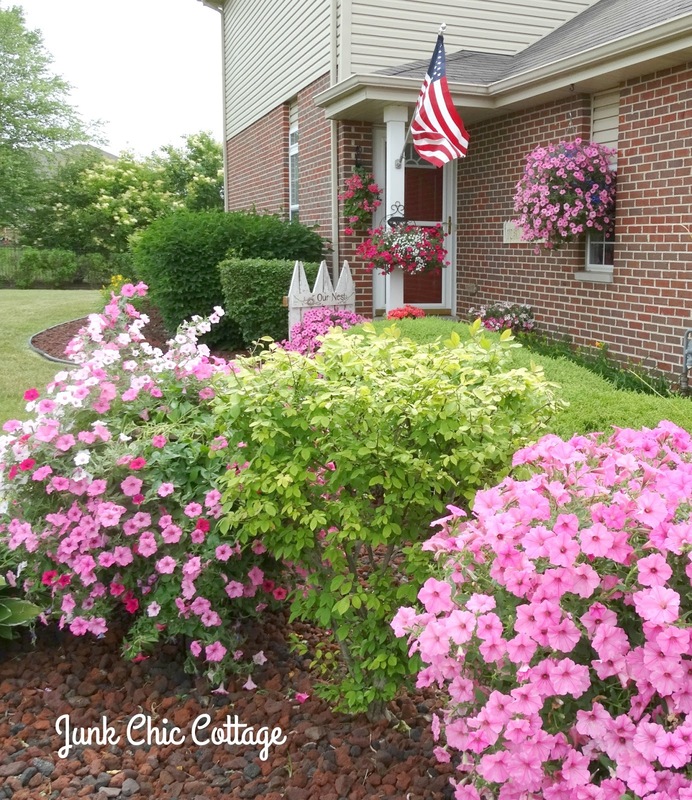 You did a fabulous job, your garden is clipped and so green, and your petunias are thriving here! BRAVO my friend! How pretty! I can't believe how huge your pink petunias get where you live. I've never seen any that big around here. Your yard looks so nice and well maintained. I'm glad you will still have a nice place to relax in outside. One word sums it up-beautiful. Those petunias are to die for!! Wonderful garden space Kris, and it's also great that you have an end unit. Our backyard faces east as well, so I know what you mean. Your backyard doesn't look that small to me, but I guess everything is relative. It's nice and level and open, but maybe you meant the patio area? In any case, it's all so lovely and oerfect for the two of you. You have beautiful grounds! So wonderful that you can put your unique stamp on them. Always nice to have pops of color in gardens. Looks lovely with your personal touches. You and Terry have worked your magic in the garden too. I am surprised to see how much space you have in your garden. Condos in our area have postage stamp yards and very little personalization is allowed. No doubt that it would look absolutely amazing...your new cottage home is shabby white fabulous! You are transforming your nest into a beautiful home for you and Terry Kris. Your flowers are gorgeous and your lounge area looks so cozy. I'm so happy for you. Wow Kris, your flowers are so lush and full already - beautiful! Your adorable picket fence welcome sign by the door not only makes your new home feel welcoming and inviting but also says, Kris lives here! Hey Kris! Awwww.. 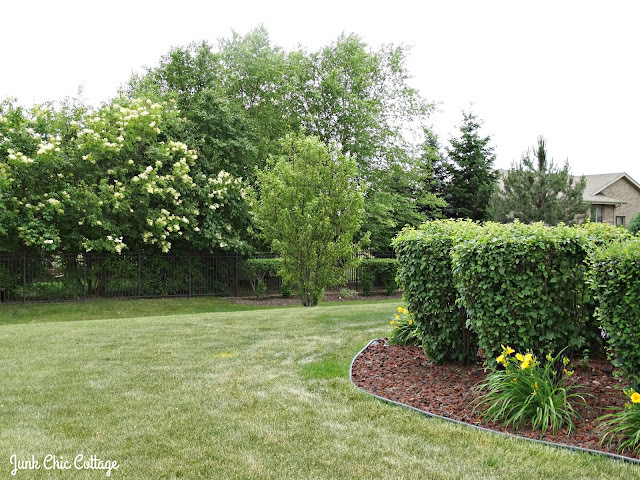 Your yard looks so pretty! I know you're happy to be settling into your new nest. I can't wait to see what you're doing inside. I still haven't posted yet... I keep saying tomorrow but have had so much going on here. Maybe tomorrow ;-) Miss you!!! Ok - this is a very encouraging post. We are thinking of downsizing to move by the grandkids. I just have cringed at losing my yard. You make it look easy, beautiful, charming, fun. THANK YOU! Just beautiful! It's looking like you're settling right in and making it cozy! 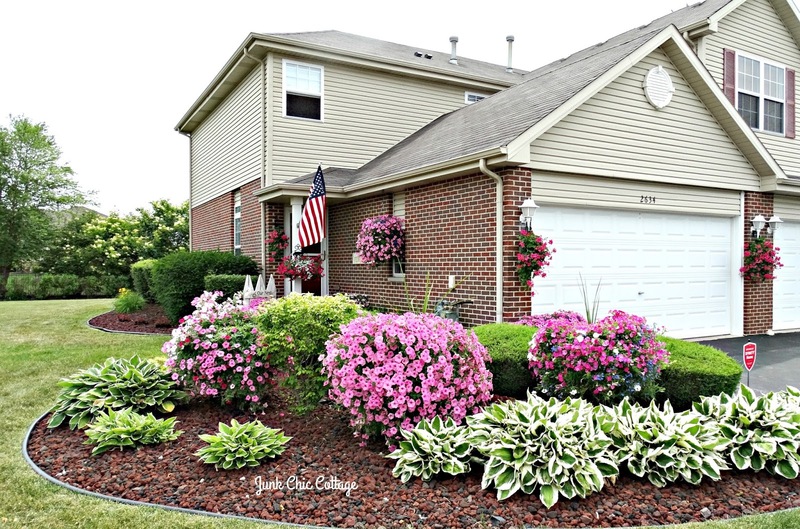 You have a beautiful yard, Kris, enhanced by your gorgeous petunias. I love the spot you've carved out in the back for sunning and relaxation. I'm sure the neighbors are thrilled to have you all there fixing up the place so beautifully. How on earth do you get your Petunias so big so fast? They are gorgeous. Of course, I'm dealing with the Texas heat so... I love your outdoor space. It's great that you are on the corner. I think you have done beautifully in all areas Kris - your petunias are awesome and the sitting area is gorgeous. 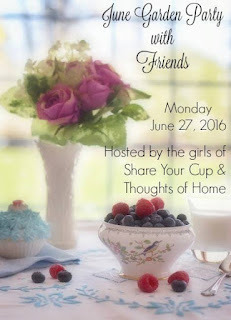 You are making a wonderful new home and it is fun seeing your "touch" in all areas! Your garden looks amazing for what a short time you have been there. I hope you are taking some time to relax and enjoy it! Kris, your garden looks like you have cultivated it over many years! It is just breathtaking! 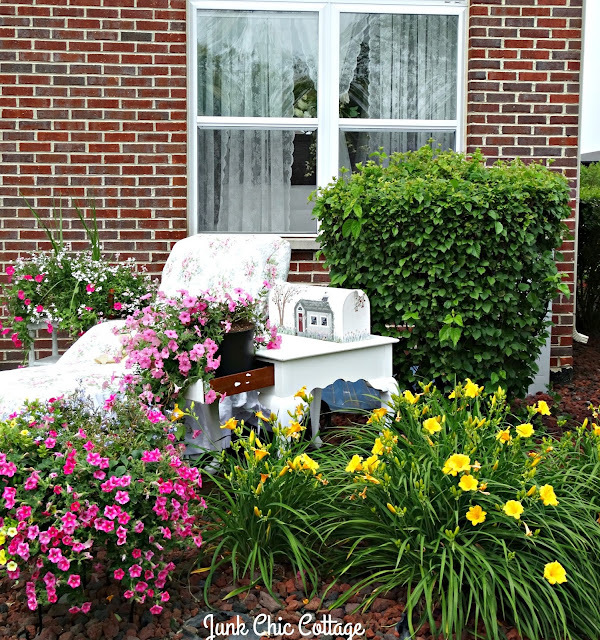 And I love the idea of re-purposing things in unusual places, like your mailbox. 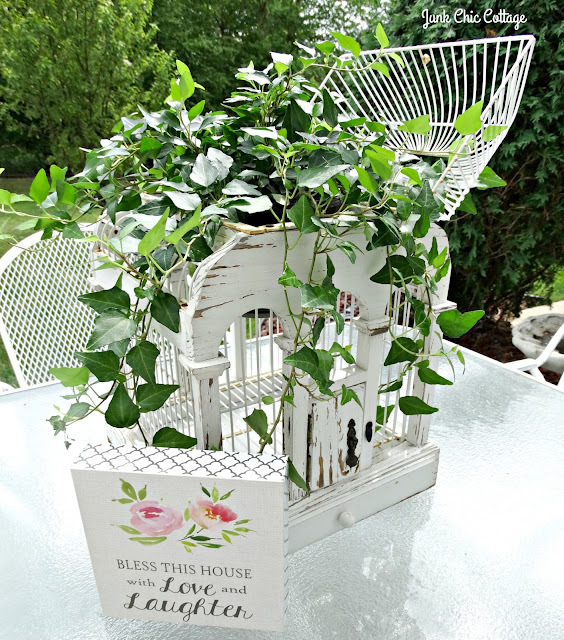 Enjoy your pretty outdoor space! 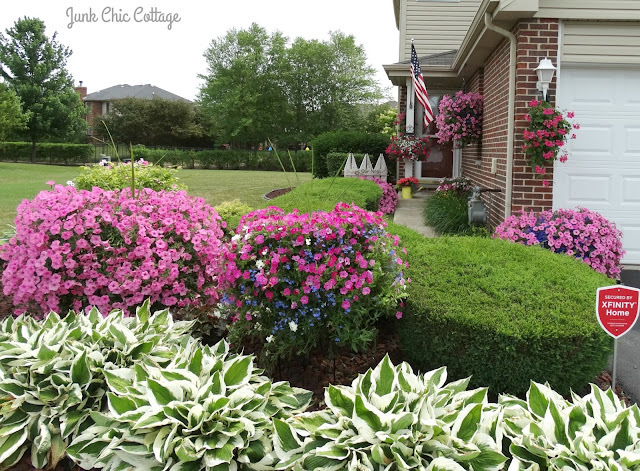 I just knew that you would have the most gorgeous flowers around your new home.....they are always so amazingly beautiful....you have such a wonderful yard for town home living!!! Your flowers are so lush, it makes the house look very welcoming. Beautiful, beautiful and I love your choice of colors too, what a warm and welcoming new space you have created! Thank you so much for sharing this beauty with us at the garden party. Kris I adore your lovely yard. Could you tell me the name of the green and white plant that is in front of your petunia's? I have one and would like to add more. Your post was like a lovely rose. Thank you for joining the garden party. Those are Hosta's and if you already have some you can thin them out and replant them. They are perennials and come back each year and in the late summer early fall they get a pretty purple flower that shoots out of it. Hope that helps.